E-Ink in Color Coming Soon! Proponents of Amazon’s Kindle and Barnes & Noble’s Nook will always tell you that the E-Ink display trumps its LCD counterpart any time. You’ll hear arguments revolving around “no glare issues,” “it’s just like reading a real book,” “it’s like looking real paper,” and more. Of course, one cannot overlook the fact that E-Ink has one drawback – it is in black and white. If the lack of colors on e-book readers is your main reason for not getting one, then you might just change your mind in the near future. Last week, Hanvon Technology, a company based in Beijing, announced the first ever color E-Ink display. The announcement was made during the FPD International Trade Show in Tokyo. Now you may be thinking that this is old news as we just heard about the color Nook. You have to bear in mind, though, that the new Nook is going to use LCD instead of E-Ink – something that old timers have been shaking their heads about. Then there’s the Apple iPad, which is great as a color e-book reader as well, but it also makes use of LCD. This new development from the Chinese company just might give e-readers a boost, although it might not be anytime soon. 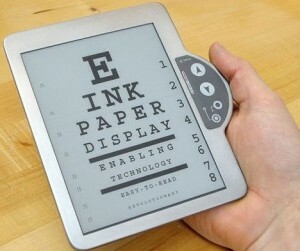 As good as E-Ink is for reading, it does have limitations such as lack of sharpness. It is also not that colorful as compared to LCD. More so, E-Ink is not able to fully handle video. Still, its developers are confident that the technology will be embraced by consumers in the future. For someone who is in the market for an e-book reader, this development is certainly something to monitor, although I might have to stick with the good old black and white displays for now. What do you think? Does the color E-Ink have potential?